Some of the most important points for developers to consider from the recent iPhone and iPad launch events are circled on these charts. 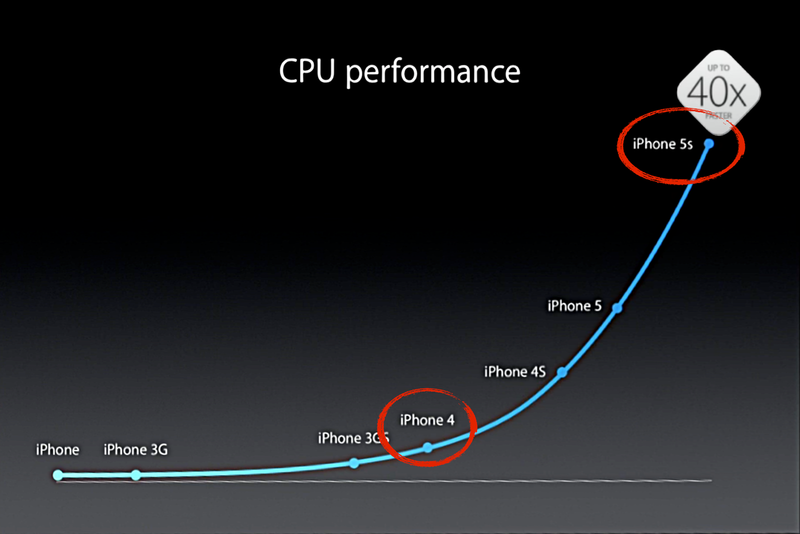 The charts show that the new A7 chip provides a significant boost in CPU and GPU performance. 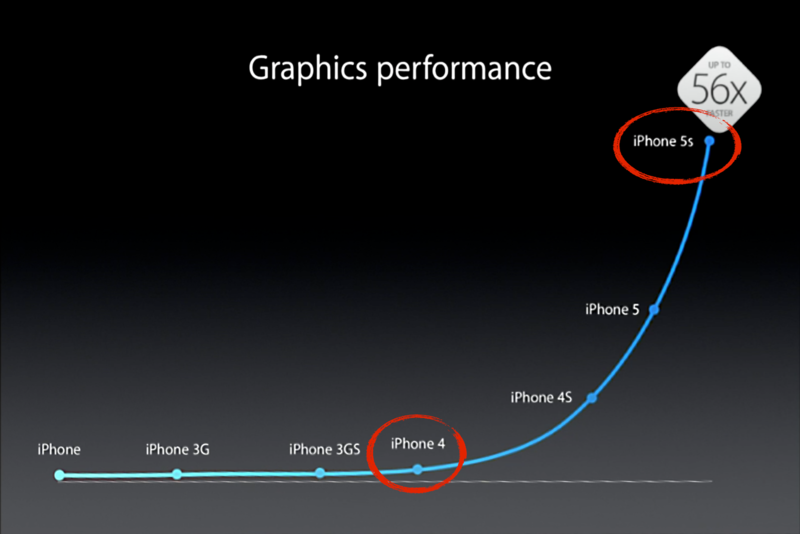 But the charts show something else—the widest range in performance across supported devices of any iOS release, ever. That giant difference in performance means it is more important than ever to test on lower-end hardware, to ensure the performance of your app is acceptable on older devices. For iPhone apps, that means testing on an iPhone 4. Recent analytics data from Localytics pegs global iPhone 4 share at 20.2% of all iPhones—a significant number of active users. If you don’t already have one for testing, you can pick up a used iPhone 4 on eBay with prices in the $150 – $200 range. For iPad apps, there are two varieties of low-end config— those with and without Retina displays. The iPad 2 and original iPad mini both use the A5 chip and have non-Retina screen resolution. Both are also still part of the current iPad lineup, making it all the more important to make sure your app performs well on these devices. The second variety is the iPad (3rd Generation). 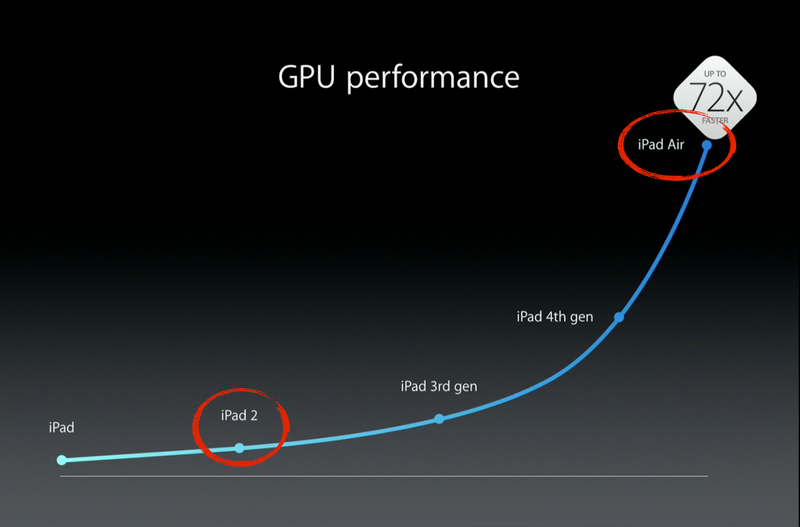 As the first iPad with a Retina display, this model provides the baseline of performance for Retina display iPads. Localytics data from last year shows the 3rd Gen iPad with 31% share when it was discontinued. That equates to millions of units still in the hands of customers. If you need one for testing, used models are currently available on eBay for about $300 – $400. The iOS Device Summary organizes devices by processor, screen size and supported OS version. The charts in this article are from Apple Special Events, September 2013 and October 2013. This entry was posted in iOS, Software Development and tagged Apple, IOS, iOS 7, IPad, IPhone, IPod Touch, Software Development, Software testing. Bookmark the permalink.